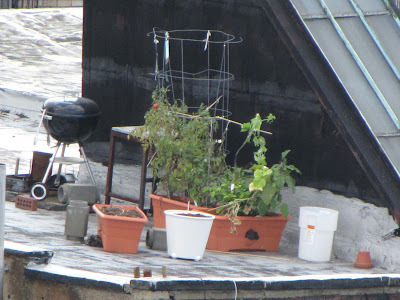 I visited the East River rooftop gardeners last weekend. Saturday was a beautiful day so I walked from Bushwick all the way to Union Square in Manhattan. I brought my camera with me so I could take a photo when I crossed the Williamsburg Bridge. I see several changes since my last post. They moved everything next to the stairway bulkhead. I think this is an excellent idea. Before the plants were completely exposed to the elements, now they at least have a little shelter from the sun and the wind. They've added one new container, it looks like one they sell at Ikea, I see soil but no growth yet. What happened to the corn? I hope they got some ears. Their tomatoes seem to be doing fine, unlike everyone else in the Northeast, myself included. The tomato supports however, look horrible, they have taken a severe beating from the elements in the last 2 months. They don't look like they'll make it to next year. I'm still not sure what's growing right next to the eggplant, but I'm leaning toward cucumbers. I see a 3rd plant that was out of view before, peppers maybe?